In a few spots in my garden, I wonder if I might have too many architectural plants together for them to have individual impact. I think of it kind of like having a roomful of divas; while it may work just fine when VH1 puts together a concert... well, imagine having them live together in a garden, with each constantly trying to outsing the others! 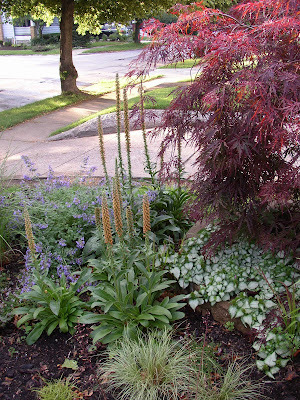 But in the above picture, it's the Spanish foxglove (digitalis parviflora) that I find so architectural right now. When I talk about "architectural plants," I suppose that I really mean plants with some special textural interest. With everything else being so fine-textured and soft/mounded in form, the rigid spires of foxglove really add interest in the picture above; hence I think of them as my architectural plant in this little area. So while all plants have color, and texture, and form... the "architectural" plants as I think of them are the ones that have that extra something. That je ne sais quoi, that elevates a plant combination beyond the normal into the sublime. I'm sure that everyone has their own thoughts on which plants fit this kind of description, since matters of taste in the garden, as in art, are so personal. And I'd love to hear some of your thoughts, especially since I'm searching for one such plant to use in my currant bed! I like your architectural plants Kim. I odn't think they conflict with what you have going. I think you have made some nice combinations. If you have some moist shade a ligularia really looks cool with its varied foilage and those tall yellow candles they put up when blooming are amazing. I have lots of shade but I have just found a spot where they will grow. kim - i love the drumstick allium! i've never seen those before but I'll definately be adding them to my wish list. I agree with Lisa, ligularia is a nice plant for bllom spike height, and with one of them (my brain is on strike right now) you get burgundy leaves. There's also delphinium for height, or you can pop in a trellis with a vine of some sort, or maybe a really vertical grass like tall wheatgrass (heh, I bet you already have this one :) Then there's barberry 'Helmond Pillar'...I bet you'll come up with something way cool, no matter what! Hi Kim, your alliums do make the scene perfect, adding lots of pizzazz. 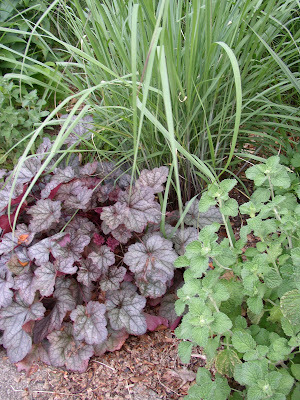 Tall lilies and grasses are working hard here to give some interest among all the shorter, similar leaf inhabitants. My favorite grass for architecture is calamagrostis Karl Foerester, not sure of that spelling. Tall flower heads on narrow plants, no flopping, lasting until late winter here, great presence. I know what you mean about those drumstick alliums. They do float on those wiry stems. As for architectural plants, I think they must be substantial with definite 'Architecture' such as a large mass of crocosmia or ligularia. Your garden looks wonderful! 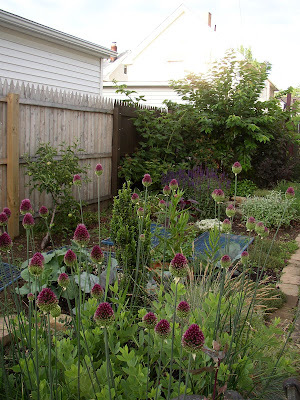 I have those alliums, and, in my first year of gardening full tilt, I have the naive idea no one else has ever seen them (hahaha). They're just blowing me away this last week as they bloom. And HOW IN THE WORLD, in CLEVELAND, do you get a Japanese maple to grow? HELP ME!!! Mine died, the little punk, so I put a weeping bald cypress in its place. I'm glad I'm not the only 1 who has trouble photographing Drumstick Alliums. (I thought it was just me.) Right now my favorite architectural plant is Aralia racemosa, the native Spikenard. It's big, bold & kind of coarse, but what a presence. For shrubs, my favorite is Cornus alternifolia. The branch structure makes this plant look good all year. Greenbow Lisa, I have dry shade... but have been giving the ligularia a try anyway! :) I admit, though, that I never really have let them bloom... might have to rectify that this year. Gina, I wonder if I can dig you some bulbs this fall? I definitely have a few to spare... I need to research that, I think. Lisa, 'Britt-Marie Crawford' has the darkest leaves, but my 'Othello' ligularia does have some nice purple on the undersides. I won't grow the barberry due to invasive issues, but I really like the tall wheatgrass--don't have that one, yet, but I like it! Kylee, yup... that's what I said, but in WAY more words! I am guilty of thinking as I type, and maybe I should get more into the think, type, rest for a day, and then go back and edit habit. lol. Layanee, I see what you mean about masses. Maybe that's why I like my drumstick alliums, because I have a nice little drift of them coming up through the baptisia? Benjamin, I had that very thought when I first planted these drumsticks, too!!!! LOL. 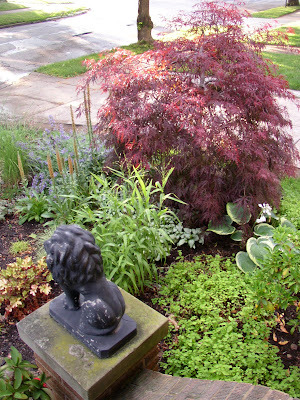 The Japanese maples are all around here, actually, and they do pretty well as long as you keep them watered. I inherited this one, but have found that it's much happier with some occasional moisture--it has fairly shallow roots. So I also keep it pretty well topdressed with Sweet Peet and/or compost as mulch. I don't know if that helps... but then, I don't know that the weeping bald cypress isn't a trade-up anyway. I DROOL over those. Mr. McGregor's Daughter, I'm glad to hear that I'm not the only one, too. :) I'm not familiar with that aralia, but based on a quick google it looks like a very handsome plant. Off to look at the cornus alternifolia--I wonder if it's going to be tiered like my doublefile viburnum? Yes, C. alternifolia has tiered branches, earning it the common name of Pagoda Dogwood (as if it looked like a pagoda).